A soldier of the church that believes in the God of this world. 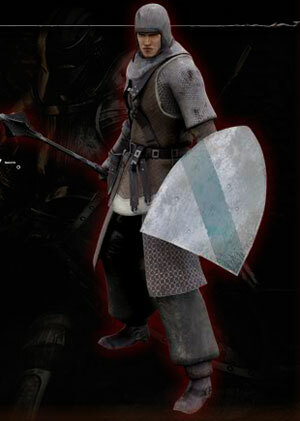 This is a tough character that is equipped with chain mail and shield. They can heal themselves with miracles, but their lack of dexterity makes them poor at handling advanced weapons. The Mace and Heater Shield are a good combo for melee combat. The Heater Shield is the smallest shield that blocks 100% of physical damage. This class also begins with a Talisman of God, and can use the Heal Miracle right from the start of the game. Dexterity is rather low, which will limit the variety of weapons you can use until it is leveled up. See the Character Builds section for possible builds.